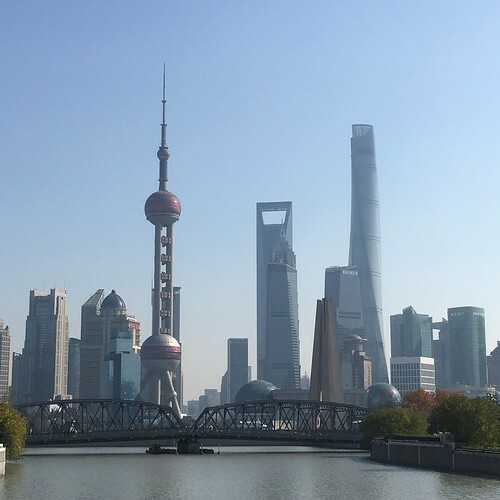 I’ve spent a lot of time photographing Shanghai’s skyline and battling with the Great Firewall of China to upload some of those photos to Flickr, but I never really gave any useful advice on where to go to get the best pictures. 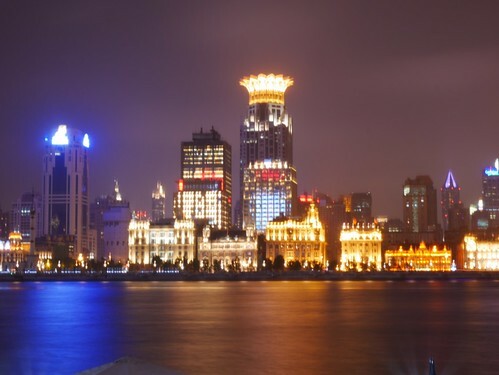 Most people go to the Bund or more accurately across the street from the Bund on an elevated pedestrian only promenade. Most tourists will walk down Nanjing Lu then bunch up within a couple 100 meters of the stairs, this can make taking photos frustrating. Perhaps the best photos are taken from within a couple 100 meters of the end of West Nanjing Lu however I’ve had good results shooting from several other spots on this side of the river. The other side of the river can also yield some nice shots, but perhaps that will be another blog posting entirely. The area in red on the map is where most people go to take their selfies. Selfies complete with selfie sticks, spinning video for WeChat and asking laowei to pose for photos are big among the rural Chinese who flock to the Bund and Nanjing Lu. 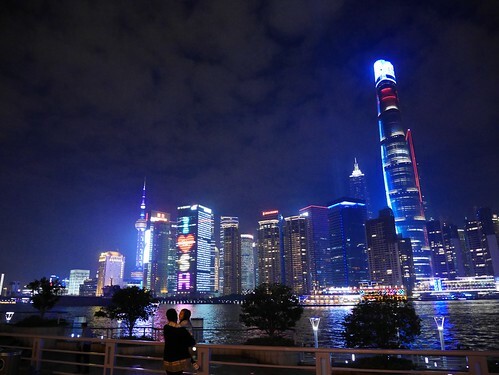 You can take some great photos in the red area, you’ll get the Pearl Tower front and centre and be able to see the three tallest buildings day or night. The problem you will encounter especially on holidays and weekends is lots of people. Sometimes I think having people in the foreground looks good in the photo, but if you just want the river and don’t like being bumped and jostled you may want to head North to the green area on the map. I’m not sure why but most people do not go North to the see the park which includes monuments and a curve in the walkway. From this curve you can take some pictures with the Pearl Tower even more front and centre or you can zoom way out and get a lot more river in. The fact that is a less popular spot also makes it more attractive to many photographers not looking for a selfie. Obviously it still helps not to be taking photos on a National holiday, but even during National holidays I’ve gotten good photos and often the lights at night are extra special during holidays. 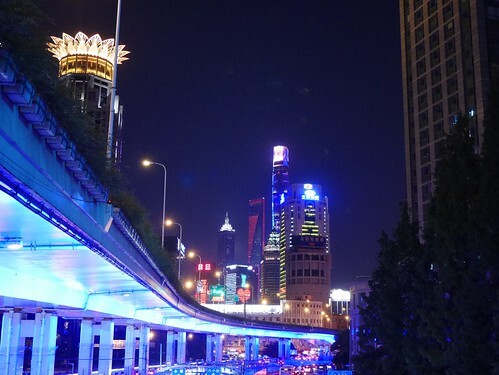 If possible you want to get photos during the day and during the night of the skyline but if you’re in Shanghai for a limited time and you want to get to Suzhou or Hangzhou, well you gotta be efficient so you probably aren’t going to walk South of Fuzhou Lu on the promenade. However besides being less crowded being further South brings the three tallest buildings more into view and at night you can try to time your photo so that the writing is less commercial and more photogenic. 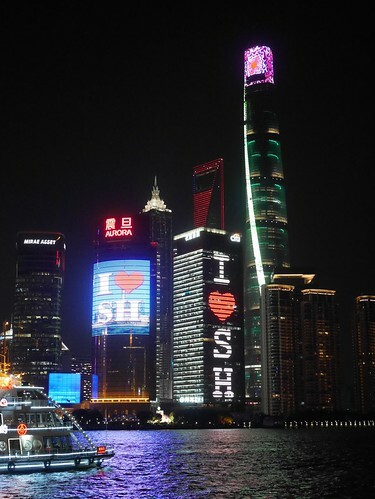 I spent a lot of time on National Day trying to capture the double “I heart Shanghai”. I think it might be possible to get a triple “I heart Shanghai” photo but you’d need a lot of luck, a heck of a camera and you’d have to travel South of the blue area on the map to the orange area. Crowds get really sparse down this end. The cruise ships dock down here, so besides taking photos from the promenade, you can get on a boat, either a cruise ship or a less glamorous and more crowded ferry. If you’re lucky you can also take photos from a building facing East. Hotels undoubtably charge more for this view. Less crowds means you can get some more intimate photos you also are more likely to be able to set up your camera to take longer exposures. I did this a lot trying to get the cruise ships going past and it is definitely hit or miss. The rail along the water is metal and rounded but there are some cement pillars where lights are positioned or trash cans so you can place a camera there. You can also setup further back where there are benches, retaining walls, when things are less crowded it is definitely less stressful, still be mindful of your personal belongings. A mini tripod can help and I prefer that to a full size tripod but then again I don’t have a honkin’ huge camera to start with. Most of these were shot with a Pansonic DMC-GM1. One other spot I’ve taken some interesting photos from and I’ve marked it in purple on the map is from a pedestrian overpass that goes under the elevated expressway. The expressway is sometimes lit up with blue LEDs so you can get that in the foreground and the three tallest buildings in the distance. You can’t see the Pearl Tower from here, which is why some mystery hotel, office, or apartment is the next spot I need to take photos from. Across the river there are some good photos and you can flip the script and shoot the Bund itself which is lit up at night too. And yes a lot of these photos were taken with a gimmicky scene mode, most likely the “cool blue” one. I may have taken some of the daytime photos in full manual, but I also may have used intelligent auto or even my iPhone. You can take good photos during the day with an iPhone at night it does less well. Update: I still haven’t been invited or paid the piper to go up one of the buildings that would make photographing the skyline easier, but I have found a new spot to photograph the skyline. Walk further North across the bridge. 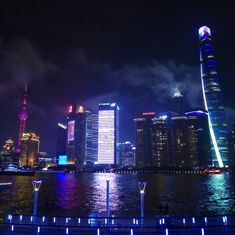 You can take a photo from on the one of the bridges to the North of the Bund and you can take pictures from further along the bend of the river as well. 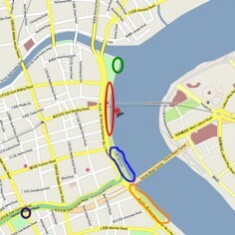 If you do not want to walk take the metro to the International Cruise Terminal station. 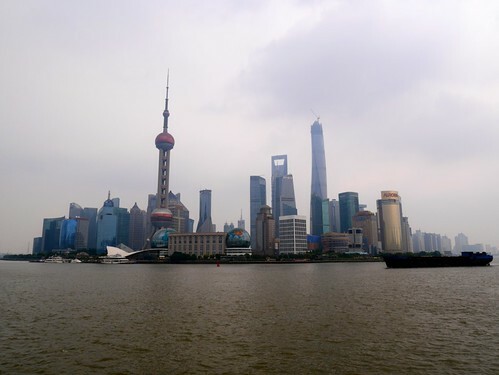 I uploaded a photo I took while visiting cafes on that side of the river as I take my Shanghai tour guide duties seriously. 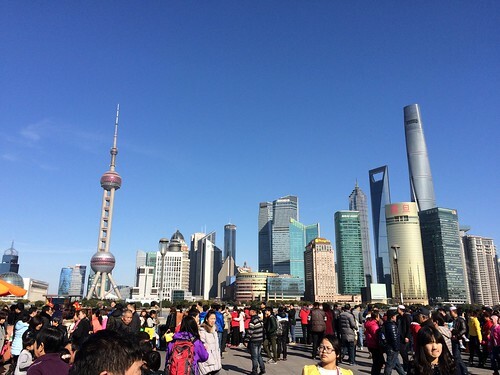 This entry was originaly posted on October 13th, 2015 , it was last edited on January 27th, 2019 and is filed under: Asia and tagged: Photography, Photos, Pudong, Shanghai, The Bund.